I have just created a window and instore display for the Hospital club. 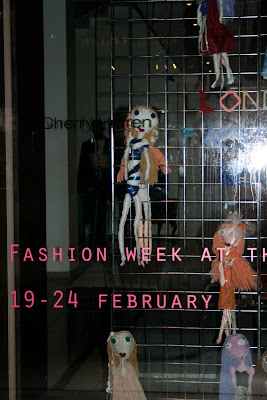 I spent about 7 hours creating the display on Friday, most of the time I was making the knitted letters of london fashion week. 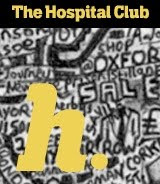 The Hospital Club is unique because it’s the only club designed specifically for the creative industries. We are set up to support and entertain people who make things and the people that help make those things happen. As part of London’s creative community our role is to discover and feed the best creative talent, and produce, publish and celebrate their work. The Covent Garden club is the place for members to meet, work, create stuff or simply enjoy themselves. So we offer everything they need to do so: bars & lounges with wifi, a members’ restaurant, cinema and a gallery, alongside state of the art music and television production facilities. The British fashion council use the venue throughout fashion week. Running from Friday 19th - Wednesday 24th February. 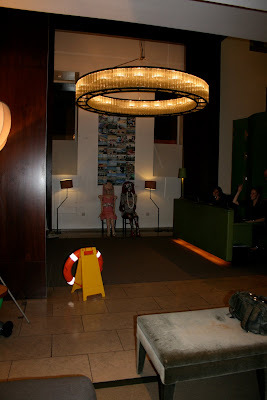 The display consists of the window, and part of the foyer in the entrance to the left of the reception desk. It was exciting when the vinyl guy came and put my name on the window. 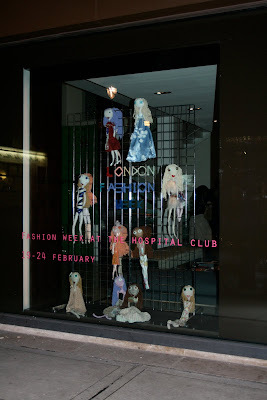 For this coming London fashion week, the hospital club window display and foyer will be taken over by Cherry Hurren textile artist and fashion illustrator. 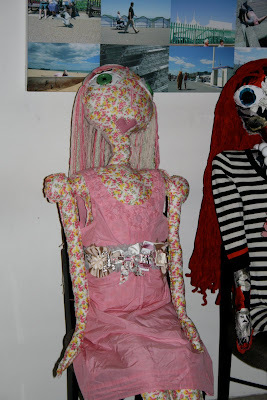 The thrift shift trend and guerrilla knitting inspire the display. A new contemporary craft form is emerging, of knitting being used to manipulate existing architecture within city spaces. For example, knitting over a lamppost. I first came across some guerrilla knitting in Brick Lane, see photo. 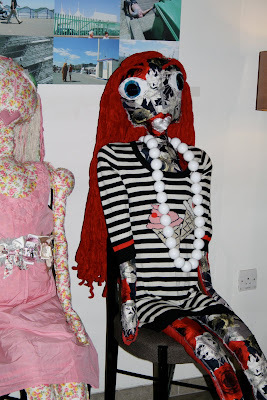 East London is known to be ahead of the trends, and an artist playground. Facebook groups promote, people uploading photos of their own yarn bombing, such as knitter please. 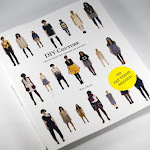 There has just been a book released in the V & A bookshop about the movement.